Issue Two of The Debate Magazine Out Now | AIER. 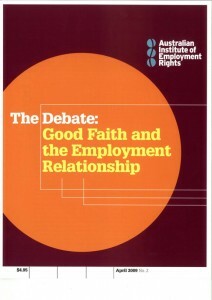 The second edition of The Debate, entitled ‘Good Faith and the Employment Relationship’, features articles by Professor Ron McCallum (Sydney University), Professor Marilyn Pittard (Monash University), Professor Joellen Riley (UNSW), and Mordy Bromberg SC, and explores good faith and its important place in the Australian workplace. The Debate is only available to members of AIER. Click here to become a member.